Since 23 January 2019, Juan Guaido has spearheaded a coup attempt, directed by the US state department. The British government joined the chorus with politicians from all major parties demonising President Nicolas Maduro. The US Treasury has tightened its death grip on the Venezuelan economy, adding to existing sanctions by imposing a full-scale oil embargo, while the Bank of England withholds $1.3bn of Venezuelan gold. US air force carriers wait at the Colombian border, ostensibly to bring aid, while Britain’s navy and marines conduct military exercises in the Caribbean. Having never stood in a presidential election, Guaido, head of the opposition-controlled National Assembly, unconstitutionally swore himself in as ‘interim president’ in January. This came days after the inauguration of Nicolas Maduro, who won an internationally observed election last May, beating opposition rival Henri Falcon by four million votes. Guaido was immediately recognised by Trump and the ultra-reactionary ‘Lima Group’ of Latin American countries. While the Wall Street Journal emphasises Guaido’s ‘growing chorus’ of ‘global support’, only 25% (48) of the world’s governments have explicitly recognised him, predominantly in Europe and North America. The rest of the world’s 141 governments maintain normal relations with the PSUV government. Guaido: hope of the nation? Standing behind Guaido is a cabal of seasoned US war criminals. John Bolton served Reagan, Bush (both senior and junior) and now Trump. Credited with spinning the ‘weapons of mass destruction’ lie prior to the 2003 Iraq invasion, he long advocated for the invasion of Iraq alongside pre-emptive strikes on North Korea and Iran. Elliot Abrams, Trump’s ‘special envoy on Venezuela’, headed up the dirty war on central America in the 1980s (see p9). Guaido’s plan for the ‘Venezuela to come’ has US interests written all over it: IMF loans, dismantling state regulation, privatising social welfare and the wholesale privatisation of oil. Bolton openly admits ‘It will make a big difference to the United States economically if we could have American oil companies invest in and produce the oil capabilities in Venezuela’. As the initial wave of opposition protests ebbed, Chavista protests against foreign intervention swept the nation. The focus turned to the US aid showdown, earmarked for the ‘interim president’ alone. Guaido declared 23 February ‘D-day’, calling for a million Venezuelans to form a human caravan to carry USAID boxes across the Colombian border. Photos of Las Tienditas bridge blocked by shipping containers quickly became international news. The bridge, completed in 2016, had never been opened due to border tensions. The US aid, food and sanitary items worth $20m, was estimated to provide for 750,000 people for ten days. A pittance in comparison to the estimated $30m a day lost through sanctions and the oil embargo. The UN, Oxfam, War Child, and the Red Cross refused to work with USAID, categorically rejecting the politicisation of aid. Neither the $2bn humanitarian aid deal between Venezuela and the UN/EU ‘International contact group’ nor the recent shipment of 933 tonnes of medical aid from Cuba, China, Russia and Turkey fitted the media narrative. The hypocrisy of stockpiling aid in Colombia’s Northern Santander region where the official poverty rate is 40% and 15% of children have chronic malnutrition was lost as journalists flocked to the border. CNN reported that the USAID shipments contained goods ‘simply unavailable in Venezuela… nutritional biscuits, toothpaste, toothbrushes’, a claim de-bunked by the Grayzone’s Max Blumenthal’s series of videos in Venezuelan supermarkets and malls stocked full of these products, albeit at sky-high prices. The problem is not a shortage of food but hyperinflation and speculation. Instead, working-class Venezuelans depend on monthly food bags and markets selling goods well below market prices. As Blumenthal demonstrates, these regularly sell toothpaste, soap, meat and vegetables in working class districts. Guaido’s plans spectacularly failed. No crowds rushed across the border to ram USAID into the country. The anticipated mass defection of Venezuelan army was a mere trickle of army support staff and private soldiers. Three weeks later they were evicted from a Colombian UN camp, abandoned by Guaido and Colombian President Duque when no longer useful. Burning aid trucks were the scoop of the day, blamed squarely on the Venezuelan army. In reality, independent journalists documented opposition gangs lobbing molotovs near the aid trucks and aerial footage showed their significant distance from the Venezuelan border. The evidence forced the New York Times to publish a belated ‘exposé’, while The Guardian removed the lie that army teargas canisters had caused the fire. Too little, too late – the media spectacle had hardened public opinion further. On 7 March Venezuela suffered a massive power outage. Caracas was without electricity for nearly five days, western states even longer. Pumping stations were shut down, water shortages ensued. Guaido and the US blamed corruption and mismanagement whilst Maduro re-ported a US-directed cyber-attack on both the computer system at the Guri Dam and the central electrical ‘brain’ in Caracas. The electrical system, 80% dependent on the Guri Dam and reservoir, is undoubtedly affected by the economic crisis and migration of qualified personnel. As the cash-strapped government attempted to pay off international debts and maintain social funding, the monetary base jumped 8500% between 2014 and 2017. The failure of the fixed currency exchange rate promoted hoarding, speculation and smuggling. This combined to produce record-breaking hyperinflation, exacerbated by crippling sanctions that make it near impossible for Venezuela to recover. Sanctions even undermine access to fuel for back-up power plants. Venezuelan crude oil is exceptionally heavy and needs processing with imports like naphtha. However, even Kalev Leetaru of Forbes magazine recognises that ‘it is likely that the US already maintains a deep presence within the country’s national infrastructure grid, making it relatively straightforward to interfere with grid operations’. Memos from CANVAS in 2010 advise that the potential collapse of the country’s elec-trical sector could ‘galvanize public unrest in a way that no opposition group could ever hope to generate’. The Guardian’s Sam Jones ridiculed any suggestion of sabotage, printing Republican senator Marco Rubio’s sarcastic tweet: ‘My apolo-gies to people of Venezuela. I must have pressed the wrong thing on the “electronic attack” app I downloaded from Apple. My bad.’ Jones fails to mention that Rubio had tweeted about the power cut three minutes after the event, before the Venezuelan government had even established the facts. Rubio claimed 296 deaths at Maracaibo’s university hospital alone, including 80 new-born babies. When the Wall Street Journal investigated, they found no babies had died at that hospital. 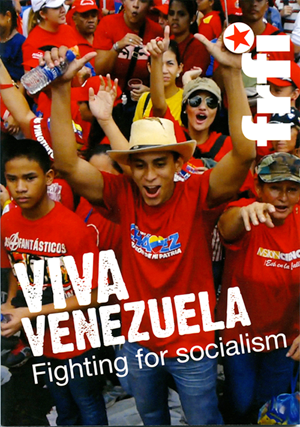 There has been next to no coverage of the mass grassroots mobilisations in defence of the Bolivarian Revolution. The BBC’s Orla Guerin only covered the Caracas opposition march on 3 February, questioning photos of the massive Chavista march only blocks away as ‘suspiciously large’. She tweeted it was ‘too difficult’ to visit it herself. There was no coverage of the masses who filled Angostura Bridge in Bolivar state to oppose intervention via Brazil, nor the hundreds of civilians who flocked to defend the border on 23 February. Solidarity protests demanding ‘Hands off Venezuela’ across 150 cities were simply ignored. Huge Chavista marches have turned out week after week across Venezuela as the working class and poor defend hard-won gains, including universal free education and healthcare, land reform, 2.5 million units of social housing and the communal networks of participatory democracy. The Bolivarian struggle for socialism may be under siege with many of these gains under threat from the economic crisis but resistance to imperialist intervention remains strong. As opposition marches lose momentum and the coup attempt stalls, the US has vowed to penalise foreign banks and companies doing business with Venezuela, pressuring India to buy its oil elsewhere. If the Bolivarian revolution falls, a fresh wave of reaction will be unleashed, undermining the struggle for socialism worldwide. Our role in Britain is to build opposition to imperialist intervention, exposing the dirty tricks of the media war.